In terms of structural complexity in Vensim, the Electricity Sector is the most complicated sector. This is in large part because the nature of some of the policies we wish to represent (for example, pricing policies or a renewable portfolio standard) affect electricity suppliers’ decisions about which power plant types to build, potentially resulting in dramatically different electricity sector structures depending on the user’s chosen policy settings. We are not simply changing the efficiency or the type of fuel consumed by an item (like a building component in the Buildings Sector), but substituting different generating technologies that have different properties (heat rates, fuel needs, flexibility needs) and may be dispatched differently based on the dispatch calculation section of the model. As a result, we must construct our own BAU scenario, based on the decision-making logic in Vensim, rather than simply reading in projections of capacities or electricity output as input data. Otherwise, when the policies are all disabled, the “policy case” in the model would not match the BAU case, because the “policy case” is still being assembled via our decision-making logic, even when no policies are turned on. In general terms, the “Electricity Supply - Main” sheet examines how much power is needed, including transmission and distribution losses. Then, it builds more power plants to supply that need (based on various factors such as the cost of building and operating different types of plants, as well as policies selected by the user). The model ensures there is enough “flexibility” on the grid to support the wind and solar being built, or if flexibility-constrained, it will build something else instead. It also checks to ensure there is enough peaking capacity to meet peak demand, and if not, it builds peaking power plants to meet that need. Finally, it chooses what power plants to dispatch to meet the electricity demand, sums fuel use, and calculates pollutant emissions. Each of these steps is explained in more detail below. The model includes eight types of power plants: coal, natural gas, nuclear, hydroelectric, wind, solar PV, solar thermal, and biomass. In order to represent differences in characteristics between plants of the same type (say, between an older and a newer coal plant), the model also uses the concept of “Power Plant Quality Levels.” Plants of different quality levels may have different properties, most importantly, different heat rates (i.e. fuel efficiencies). The “preexisting retiring” quality level represents the average plant (of a given type) that exists at the start of the model run (in 2013) and is projected to retire by the end of the model run. 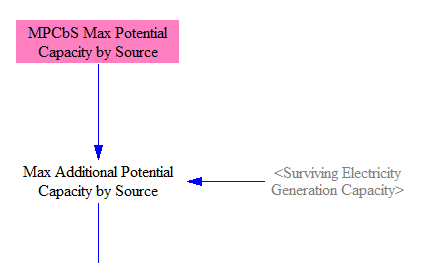 The “preexisting nonretiring” quality level represents the average plant (of a given type) that exists at the start of the model run and is not projected to retire by the end of the model run. The “newly built” quality level represents the average plant that will be built during the model run. All capacity in the model has one of these three quality levels. There are several reasons why we choose to represent quality levels based on the average plant of a given type that will retire, will not retire, or will be built during the model run, as opposed to, for example, basing our quality levels on particular technology types (such as subcritical, supercritical ultra-supercritical and circulating fluidized bed coal plants). One is that we may use the same category definitions for all plant types, allowing more uniform equations and representation in Vensim. A good example is that all power plants built during the run are of the “newly built” quality level, rather than needing decision logic for how much of each type of coal plant is built in each year. (That type of calculation can be handled outside of Vensim, when determining the numerical properties of the “newly built” quality level for a given plant type.) Another reason is to help keep the model simpler: using technology-based categories is unnecessary to achieve a good representation of the effects of policies on the power plant fleet, and excess complexity makes the model harder to learn and to use. Third, quality tiers don’t always map perfectly onto technologies- it’s possible to create a better-performing or worse-performing plant that uses the same core technology. 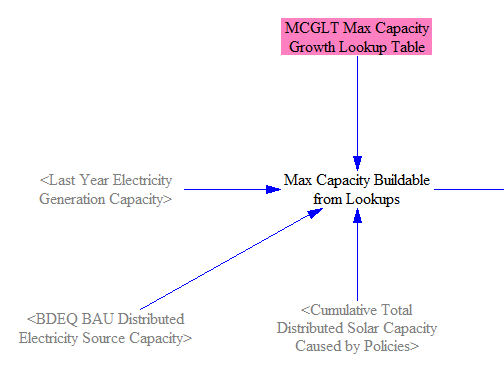 Finally, we convert from capacity to potential output using the target electricity capacity factors and determine the remaining amount of new potential output we need, after the mandated capacity construction policy. Next, the model determines what must be built to comply with the Renewable Portfolio Standard (RPS) policy. 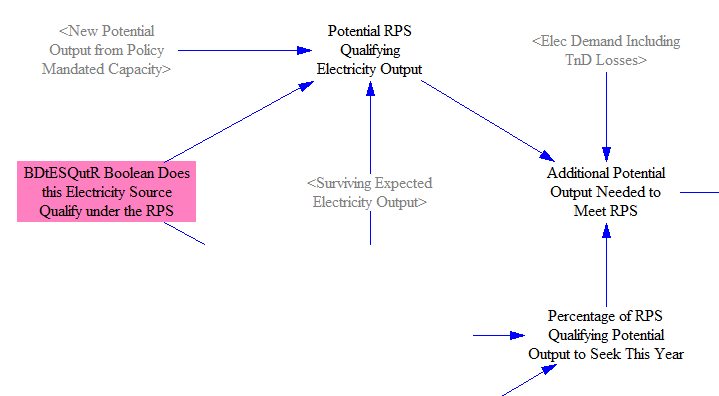 Each type of power plant either qualifies or does not qualify as contributing to the achievement of the RPS. In the U.S., the RPS-compliant power plant types are non-hydro renewables. 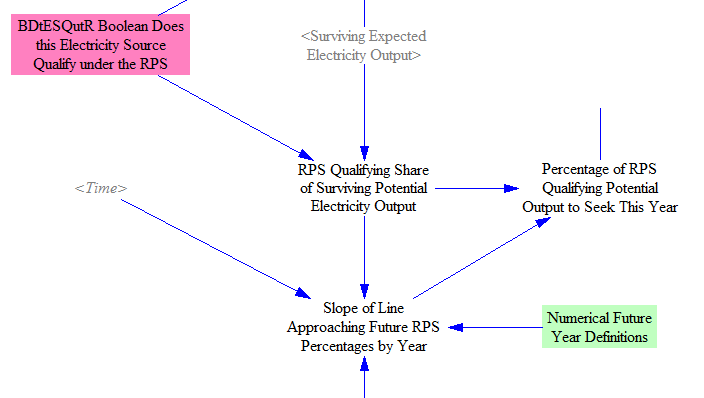 Unlike all other policies in the Energy Policy Simulator (EPS), electricity suppliers are given foresight of the full schedule of RPS percentages for future years. This allows them to intelligently build to meet a future RPS target, rather than encountering an unrealistic shock in the year when the target occurs (or the year when the target surpasses the percentage of qualfying renewables that already exist). 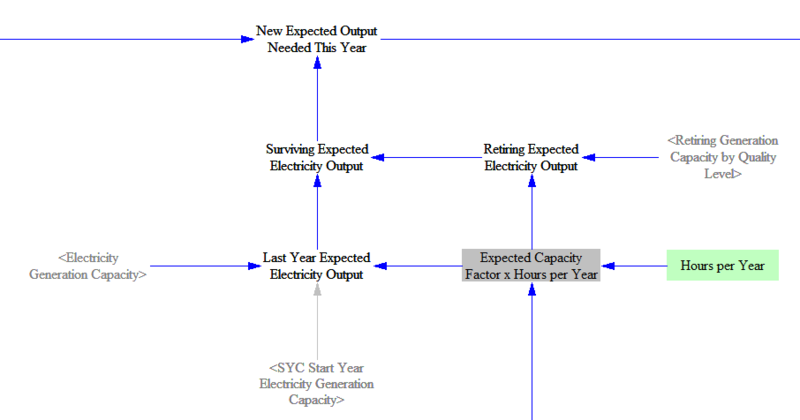 Note that although the variables in the diagram above refer to “output” rather than “potential output,” all outputs at this stage in the calculation flow are “potential output” values. Actual output values come after the dispatch calculations, below. In order to perform an allocation in Vensim, using Vensim’s ALLOCATE AVAILABLE function, we need to set up what is called a “Priority Profile.” This tells the model how to decide what to build. We determine priority based on cost: the lowest-cost type of plant is built first, then the next-lowest cost, and so on. However, each plant type does not have a single cost. A plant type is represented by a normal distribution (a bell curve) of costs. This reflects the fact that in the real world, conditions vary from project to project. Some wind plants might be in windier areas than others. Some coal plants might be located in places where it is more or less expensive to get regular coal shipments. There can even be non-physical factors involved, such as differences in financing costs depending on project risk factors and borrower creditworthiness. By representing each plant type’s costs as a bell curve, we obtain much more realistic outputs than if we assumed the model built all of one plant type that it could before building any of the next-most-expensive plant type. In this example, we only show two bell curves, though in the actual model, there is one bell curve during the RPS allocation for each of the RPS-qualifying plant types. Each curve has its own unique midpoint on the cost axis (X-axis), its own standard deviation (curve width), and its own volume under the curve. The Y-axis is the quantity of potential output that can be built at a given cost. The volume inside these curves corresponds to a quantity of potential electrical output built: cost (X) multiplied by quantity per unit cost (Y). We know the total amount of RPS-qualifying potential output we need to build, which is the volume under a portion of the black “Total” curve. Accordingly, the model goes from left to right on the cost axis, filling in the volume under each individual plant type’s bell curve, until a total amount of volume has been filled in equal to the quantity of RPS-qualifying potential output needed this year. 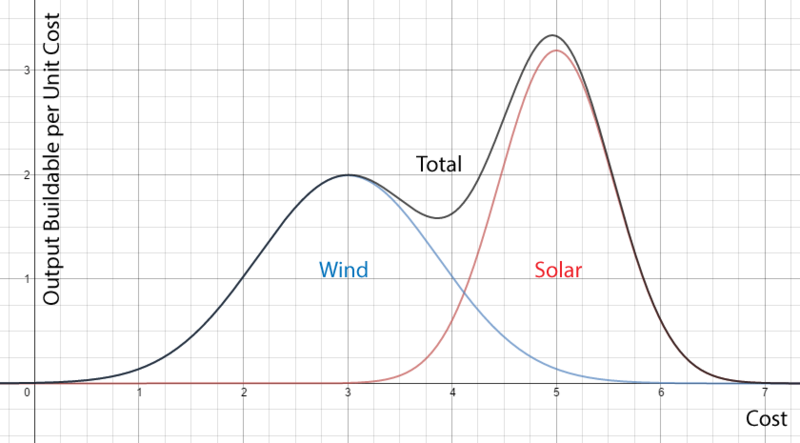 If this point is reached anywhere between the “3” and “6” numbers on the cost axis in the example diagram above, then a non-trivial amount of wind and a non-trivial amount of solar will be built, and neither wind nor solar will be built at the maximum possible rate this year. 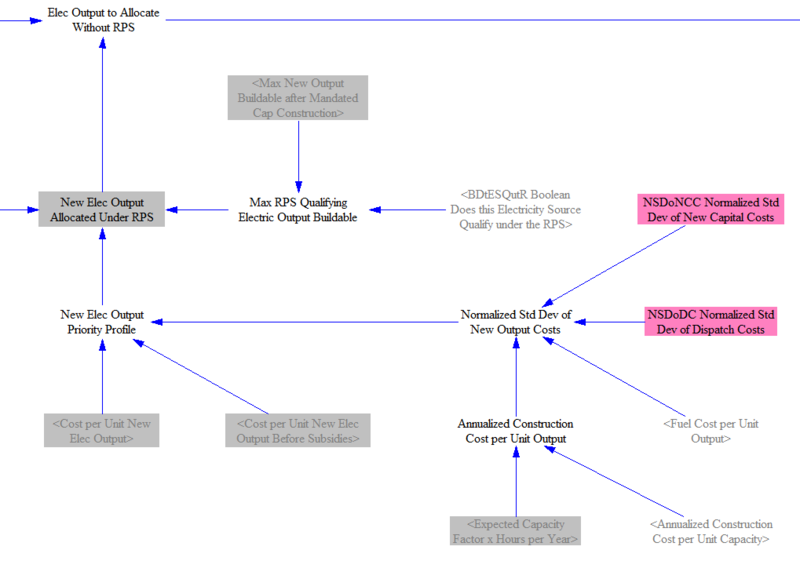 Note that the model will not exceed the maximum amount of buildable output in the allocation function. This means that if the model is in a state where the simulated year’s level of deployment is so far behind the RPS in that year that even building all of the RPS-qualifying power types at the maximum possible rate cannot satisfy the RPS, then the RPS will not be met in that year. In the example diagram above, this would correspond to needing so much RPS-qualifying output to be built in a single year that we reach the “7” number on the cost axis and still haven’t encompassed enough volume under our curves. 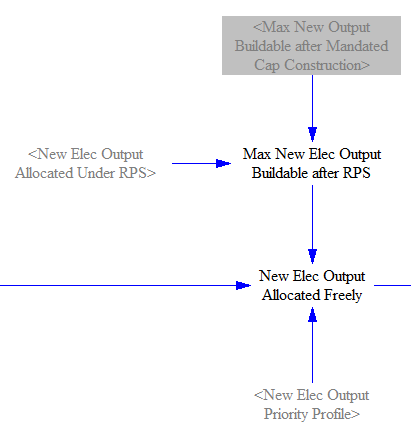 Once we have allocated potential output under the RPS, the result is subtracted from the remaining potential output that still needs to be built after the mandated capacity construction policy, leaving the amount of demand that is still unmet after the RPS policy has been applied. 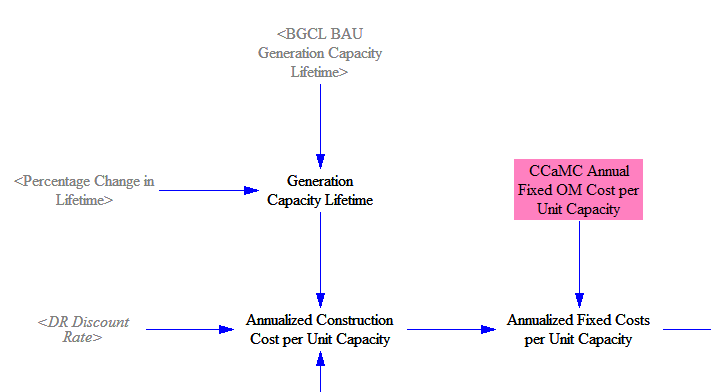 The model includes calculations of cost to build and operate different types of power plants. 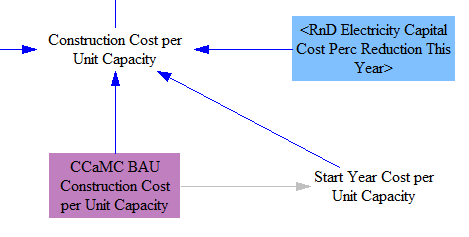 These costs are used in the allocation functions for construction of new capacity (described above) and in the dispatch calculations (described below). Since all other costs are annual, we annualize the construction cost to make it comparable. We annualize the cost over the power plant’s expected lifetime, applying a discount rate to account for the effect of time on the value of money. (The model works in real dollars, so the discount rate does not need to account for inflation.) The discount rate is taken in as input data and, like all input data, it can be edited by the model user. After annualizing the construction cost, we add the fixed O&M cost, which is provided per unit capacity, to find the annual total fixed costs per unit capacity. If the carbon tax policy is enabled, we add a certain amount of cost reflecting the “Nonfuel GHG Emis per Unit Output,” or embedded carbon emissions in the equipment and building materials. Although these emissions are associated with physical construction and therefore would seem to be most naturally related to unit capacity, the lifecycle analyses from which these data were obtained already converted them to a “per unit output” basis, so we use that directly. We report the result both before and after subsidies, because the unsubsidized version must be used in the allocation functions, when converting normalized standard deviations of cost into standard deviations of cost. This is because the normalization process in the cost source data only looks at the range of actual costs incurred, irrespective of whether subsidies later repaid the electricity suppliers. For all other purposes in the model, we use the cost numbers that factor in subsidies. In each model year, new power plants are built (unless there are enough surviving plants to meet demand) and old power plants are retired. The means of determining how much of each type of plant is discussed above, so this section will mostly discuss retirements. There are three retirement mechanisms: the natural retirement rate (which can be affected by the lifetime extension policy), retirements caused by the early retirement policy, and retirements caused when a power plant type becomes uneconomic to keep running. 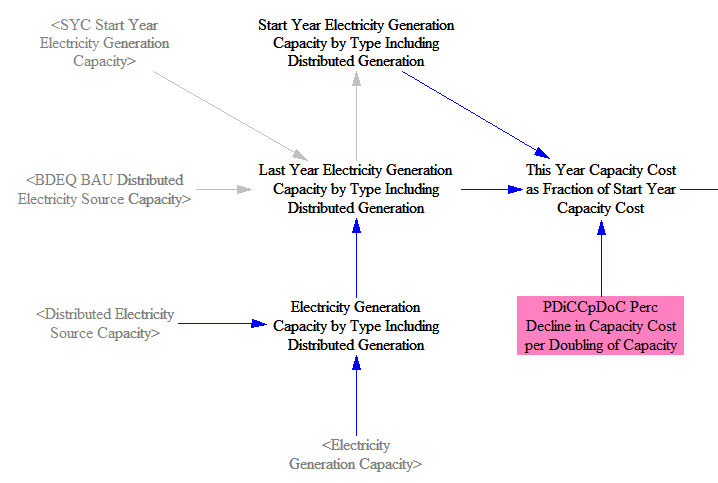 Electricity generation capacity is tracked using a stock variable. Vensim processes inflows and outflows to/from stocks only after the relevant timestep has elapsed. So in model year 2020, the stock variable has the value it had in year 2019 plus the inflows of 2019, minus the outflows of 2019. 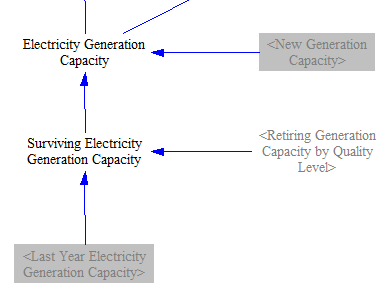 To improve clarity about this process, the stock variable is named “Last Year Electricity Generation Capacity,” and when the current year’s capacity is needed in equations, the current year’s inflow and outflow must be explicitly added or subtracted from the stock. 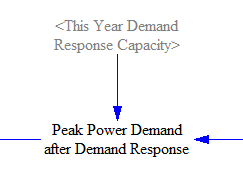 The “Start Year Electricity Generation Capacity” refers to the capacity in the year before the first calculated year of the model run. Assigning retirements to quality levels is very simple. If there are retirements of a given power plant type (such as coal), they will come out of the “preexisting retiring” quality level, unless there are not enough plants of that quality level left to retire. After that, they come out of the “preexisting nonretiring” quality level, and if even that stock is exhausted, the retirements start coming out of the “newly built” quality level. Remember that the nomenclature of the quality levels - “preexisting retiring” and “preexisting nonretiring” refers to the properties of the average plant of its type that will or will not retire during the model run in the BAU case. By enabling certain policies, it is possible to retire plants of higher quality tiers. This is normal model behavior. Our input data provide a particular amount of capacity of each type that is projected to retire in each year of the model run. Since these data are not based on power plant lifetimes, we implement the lifetime extension policy as a change in the BAU retirement rate (i.e. retirements are reduced by the same percentage as that by which the lifetime of plants is being extended). This representation can be thought of as what would happen if the system were to reach steady state. If a lifetime extension policy were to be implemented suddenly, one would expect zero retirements of that power plant type for at least a number of years equal to the magnitude of the lifetime extension, followed by a resumption of retirements at the regular rate. Eventually, the system would approach the steady state, as electricity suppliers begin planning and building plants when taking the longer lifetime into account. The latter approach may be more realistic within the model’s run period, but our input data make it questionable to model a “sudden” life extension policy, and representing the policy in the steady state manner may provide more of a sense of the policy’s long-term effects. Finally, we have two mechanisms that drive “early” retirement. 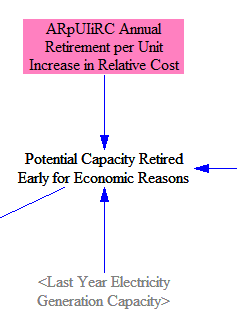 The first is economic: when the cost of electricity from one new plant type (that is, including annualized construction costs) is made higher than in the BAU case via the user’s policy settings, some amount of additional retirement will occur, if it is a plant type susceptible to economically-incented retirement. The second is the user-set early retirement policy. 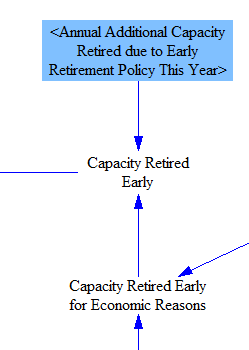 Finally, we add in any retirements specifically mandated by the user via the early retirement policy to find the total capacity retired early. Two of the power plant types in the model- solar PV and wind- are “variable” generation sources. This is because their ability to generate power depends on the presence of wind and sunlight. (While solar thermal also requires sunlight, its thermal inertia makes it less vulnerable to changes in sunlight levels, so we do not treat it as a variable source in terms of requiring flexibility support in this model.) Certain technologies can provide flexibility services, such as energy storage systems, fast-ramping natural gas peaker plants, and the like. These flexibility services make it easier to integrate more variable generation into the electric grid, because they can take up the slack in the event of a drop-off in sunlight or wind (and in the case of energy storage systems, they can absorb extra power during sunny or windy times to recharge themselves). The Energy Policy Simulator (EPS) uses annual timesteps, whereas the timescale over which solar and wind variability happens is often an hour or less. Therefore, we use an abstraction to capture the need for flexibility to support renewables deployment. The model defines a synthetic unit called a “flexibility point.” One flexibility point is a quantity of flexibility on the electric grid that is able to support one megawatt (MW) of variable generation. Flexibility points are based on capacty (MW) rather than electricity output (MWh) because the relevant factor is the extent to which flexibility can address large, relatively sudden power needs (demand spikes or temporary drops in generation from variable renewables), not the portion of the year during which flexibility providers will be called upon to deliver these services. 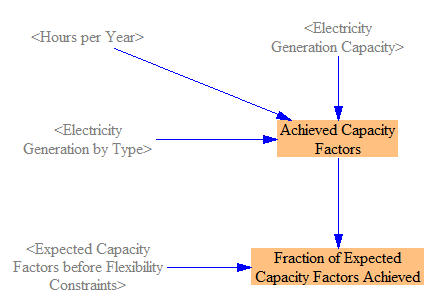 Therefore, the different capacity factors of different plant types or quality tiers does not influence their flexibility point requirements (as these things affect generation but not capacity). We allow each flexibility point to support one MW of wind and one MW of solar PV, because wind and solar PV tend to need assistance at different times of the day. (Solar PV needs support at night, and generally, wind needs support during the daytime.) We use results of a modeling study that used a fine timescale and a detailed electricity supply, demand, and transmission model to estimate the number of flexibility points provided by a given quantity of each of several technology options. 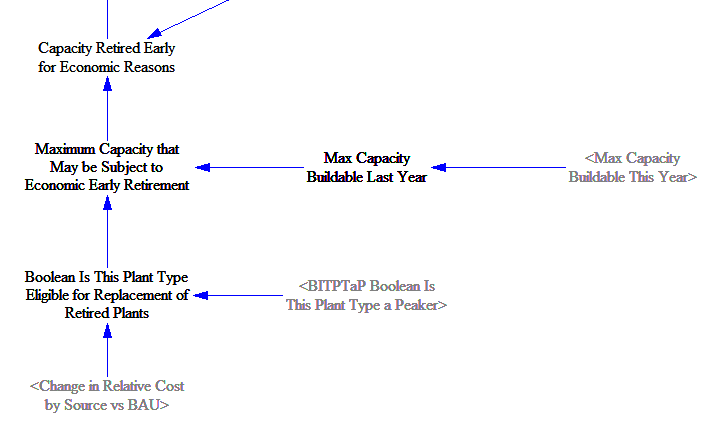 We find the available capacity of peaker plants. Which types of plants count as peakers can vary based on model version (country or region represented), but often natural gas peakers and petroleum-fired power plants will qualify. We convert peaker capacity to flexibility points based on the results of a separate modeling study, which we take in as input data. No policy affects the quantity of pumped hydro storage available. We convert to flexibility points using a conversion factor that is in between those for two types of pumped hydro: pumped hydro that can only make two mode shifts (charging or discharging) per day and pumped hydro that can make many mode shifts per day. For cost purposes, the model assumes battery storage to consist entirley of chemical batteries, though it could also represent the flexibility benefits from similar technologies that make energy available on demand, such as compressed air or flywheels. A policy allows the user to specify an annual growth rate above and beyond the BAU rate of non-hydro storage deployment. As with other flexibility point-providing technologies, results of an electricity model are used to convert the quantity of storage into a number of flexibility points. Demand Response refers to technologies or processes used to shift electricity demand to other times of the day, which can be used to lower peak demand and to assist with integration of variable renewables. The demand response policy allows the user to specify a fraction of the additional demand response potential to be achieved, beyond BAU. 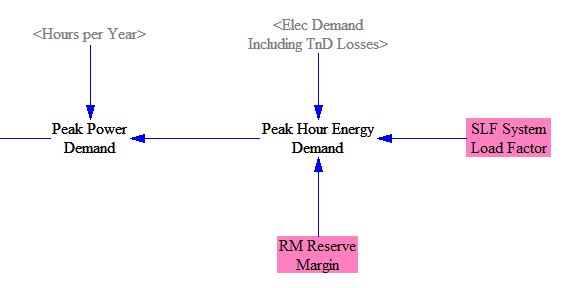 As with other flexibility point-providing technologies, results of an electricity model are used to convert the quantity of demand response into a number of flexibility points. 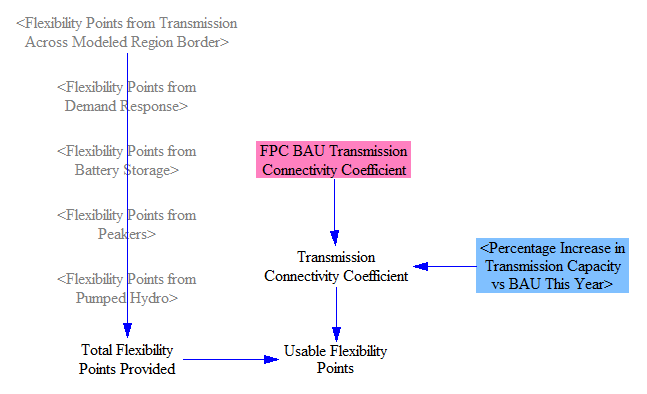 Since the EPS does not include geography of the modeled region, we use the concept of a “transmission connectivity coefficient” (TCC) to represent the level of connectivity between sources and sinks of flexibility points. A TCC of “1” imples perfect connectivity of all sources and sinks of flexibility, as if any two points in the electric system were connected by unlimited transmission. A TCC of “0” implies that no sources of flexibility points are connected to anything else. All real-world electricity systems will have a TCC value between zero and one. 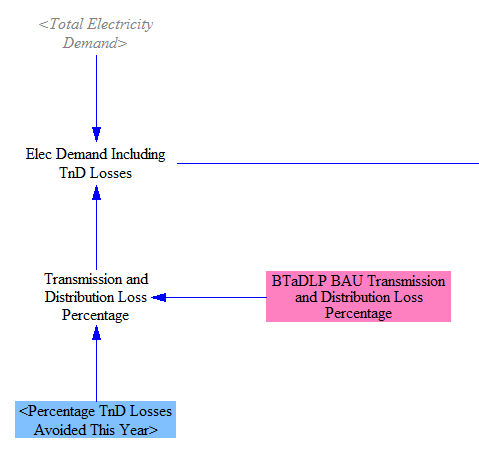 We estimate the existing system’s TCC using the results of a major study by the National Renewable Energy Laboratory, which found the amount of transmission that would be needed to support a given amount of renewable capacity, given certain quantities of flexibility point-providing technologies (which we convert to flexibility points using the factors discussed above). While this is not the only solution- it is possible to integrate just as many renewables with less transmission if more other things are built- it is the lowest-cost solution for renewables integration and therefore is the best choice for our BAU case. 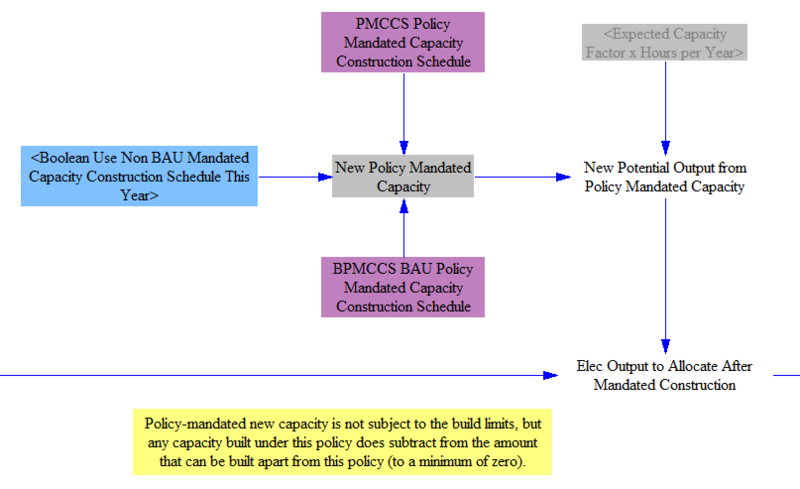 A policy lever allows the user to increase transmission built-out by a percentage of BAU. This only affects the TCC here, but on the Electricity Supply - Cash Flow sheet, it is converted to units of physical transmission capacity, and from there, to costs. Note that as power plants are built, we assume sufficient transmission is built alongside them to operate them in the same manner as existing plants in the BAU case. For wind and solar PV, this means that the TCC remains unchanged as you build more wind and solar, rather than the TCC dropping (due to increased need for connectivity as there are more things to connect). 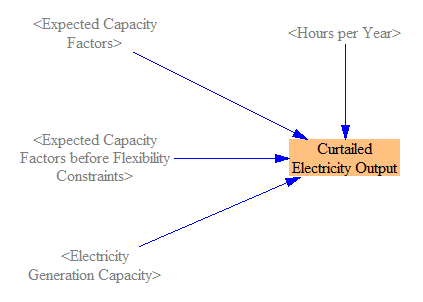 For other electricity sources, this simply means that they run at the expected capacity factors for their type and quality level, assuming they are dispatched via the dispatch calculations (discussed below). 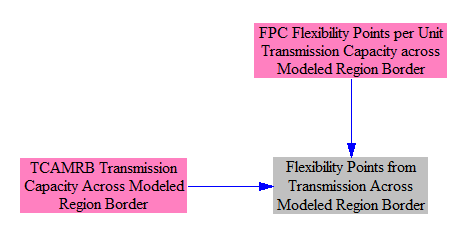 In other words, as you build more plants, an amount of transmission necessary to maintain the same level of service enjoyed today is assumed to be built alongside, and this base level of additional transmission does not have its costs explicitly calculated and attributed to the policy package. The transmission policy lever represents transmission build-out beyond this level, improving the service level of plants that require flexibility services. The transmission built by this policy lever does have its costs attributed to the policy package. 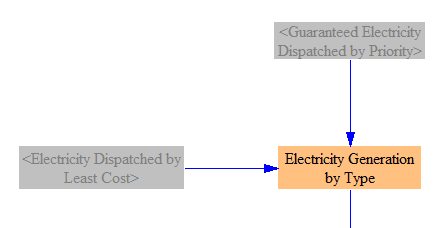 The model includes two dispatch mechanisms: guranteed and least-cost. 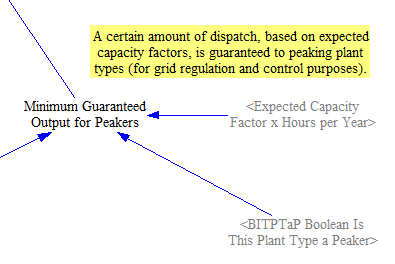 Guaranteed dispatch is a versatile mechanism that allows the user to specify the priority ordering of different power plant types as well as what fraction of each type of plant is dispatched. It can be used to represent environmentally-preferred dispatch, favoring coal plants that have preexisting contracts that guarantee them the ability to dispatch power, or anything in between. 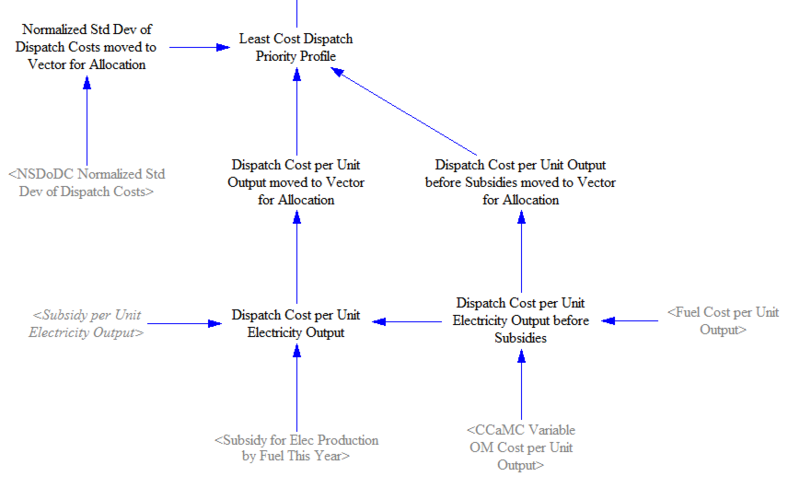 Least-cost dispatch selects which plants run on the basis of lowest marginal cost. 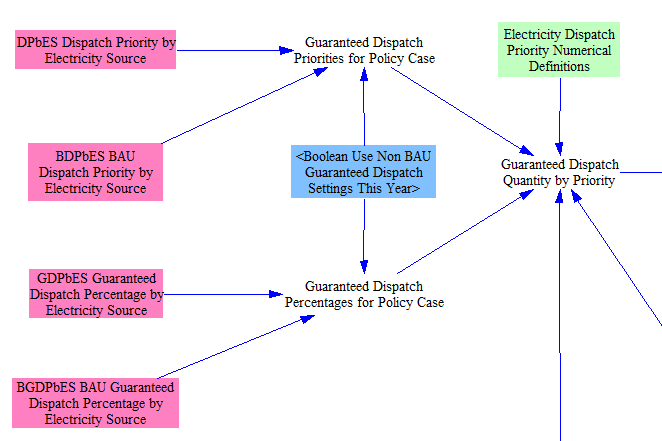 Note that the “Guaranteed Electricity Dispatched by Priority” and “Demand Remaining to Satisfy After Priority Level” variables in the screenshot above rely on mapping one subrange of the “Electricity Dispatch Priority” subscript to a different subrange of that same subscript, so as to cause Vensim to loop through each element of the “Electricity Dispatch Priority” subscript at each timestep. This is an unusual but powerful way to use subscripts in Vensim. The only notable step in this process is the need to move all of the resulting values to a “vector” (a one-dimensional matrix) before using the values in the allocation function. This is to work around a limitation in Vensim: the program is only able to perform allocation of a quantity into “buckets” defined by values of a single subscript. However, our power plants are broken into buckets along two dimensions: power plant type (11 types) and quality level (3 quality levels). The solution is to simply use a new, 33-element subscript (in the model called “Power Plant Type by Quality”), and load all of the values from our double-subscripted variable into the corresponding elements of the large, single subscript. We find the cost per unit output (from fuel and variable O&M). Then, we create a version that includes subsidies (for use determining the median dispatch cost, or midpoint of each bell curve) and a version that does not include subsidies (for converting from a normalized standard deviation to a standard deviation of each bell curve). We move these values, as well as the standard deviation of dispatch costs, into 33-element vectors, so we can generate a 33-element vector Priority Profile, to use in the allocation operation. 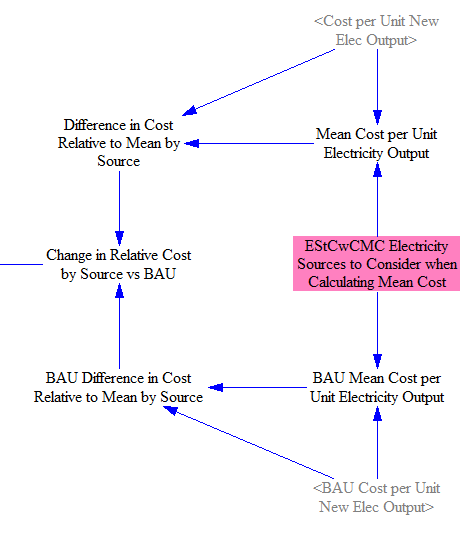 We perform the allocation of remaining electricity demand on the vectorized quantities, then move them back into a two-subscript variable, “Electricity Dispatched by Least Cost,” for use elsewhere in the model, as shown in the following screenshot. We use emissions indices (per unit energy in the fuel) and heat rates (energy units of fuel per MWh of electricity) to obtain pollutant emissions indices per MWh of electricity. We also apply any carbon capture and sequestration that is performed by the electricity sector, reducing CO2 emissions but also increasing fuel consumption (to power the CCS process). We apply the emissions indices per MWh to the total generation and add in the CCS effects to obtain an emissions total for the electricity sector by pollutant. This section includes a few calculated variables that may be of interest in evaluating the electricity sector’s performance or characteristics. Some of these values can be useful for debugging or evaluating the realism of the model’s response to a given set of input data or policy settings. We report unmet electricity demand (if any), to make it easier to notice if there are any years with unmet demand. Typically, there are not any such years. We report the percentage of electricity generated by each source (coal, natural gas, wind, etc.). We also report “Renewable Electricity Generation Converted to Primary Energy.” This statistic is used in calculations of total primary energy, which are generally based on fuel consumption rather than electricity generation. We include plant types that do not use fuel from the primary energy total with an “effective” heat rate (taken from the rate of coal plants) that makes them more comparable to other plant types in the primary energy calculation. Primary energy is not used for any purpose in this model- it is simply reported. This statistic may be of greater interest and use for non-U.S. countries. It was originally added to accommodate the reporting requirements for a China version of this model.